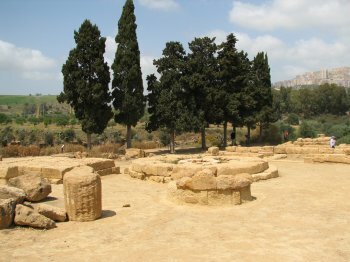 The Archaeological Area of Agrigento comprises the remains of a great Ancient Greek city in the mediterranean. 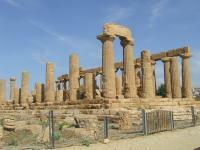 Agrigento or Akragas was founded in the 6th century BC by Greek settlers originating from Rhodes and Crete. They left unstable Greece, that suffered from civil war, famine and social unrest. Groups of settlers spread out over the Mediterranean, with the purpose to build their own and better Greece abroad. These colonies acted politically independent from the motherland and each other. 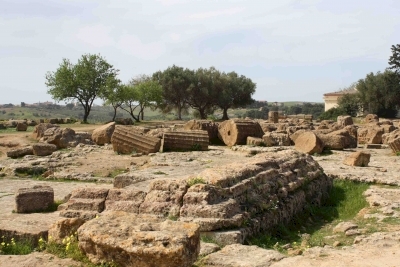 The city of Akragas flourished especially in the 5th century BC, alternating between tyranny and democracy. Most of the remaining temples were built in this period. Its position was lost in 406, when the Carthaginians all but destroyed it. It was rebuilt, but suffered defeat again in 210 when Akragas was besieged by the Romans. 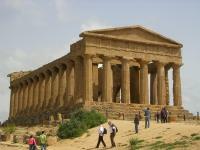 Driving in Sicily for sure is different on a working day: it took me 3 hours to get from Noto to Agrigento, about 150 km. First there were the hills around Ragusa, which steepness proved too much for the loaded trucks. And then came the rather hellish outskirts of Gela (an even earlier Greek settlement than Agrigento, how times have changed! ), where every car just seemed to want to park on the other side of the street and where your eyes are blinded by a forest of screaming billboards. All this made me arrive in Agrigento around 11.30, not the best of times because of the sun and the scores of tour buses. I started my sightseeing at the top, at the archeological museum. The museum is pleasant enough, but specializes on vases a bit too much to my taste. The large Atlas statue however is definitely worth a look. The ruins are situated downhill, and split in two parts by a busy road. The best preserved temple is the Temple of Concord, partly under scaffolding nowadays. The rest of the large grounds is scattered with stones, some forming sacrificial altars large enough to slaughter 100 oxen at one time. All in all, I was a bit disappointed with Agrigento. Having seen already quite a number of Greek archeological remains, one gets a bit spoiled and these certainly aren't the best ones for a superficial visit. The site is applauded by ICOMOS as an authentic example of Greek colonization (and not Hellenistic from a later age). Personally, I was much more impressed by Paestum, also a former Greek colony on Italian soil. March 2019 - on our 6th day we arrived in Agrigento. The city was flooded with people and traffic. There was no way to access the Val di Tiempi. Very unfortunate, since there was Sagra del Mandorlo in Fiore. A festival dedicated for blooming almond trees with dances and food. We are a bit sad, that we missed this event. Next day however, we visited the archaelogical park. You pay 10€ entrance and can take a walk along the temples. They are located on a geological fold and if you look into the right direction, you find many nice motivves for photography. If you look in the direction of Agrigento, you see eyesores of buildings from the 60s, destroying the authenticity and ruining the cultural landscape. We had a nice few hours in the park, before we continued our journey back into the islands interior. We visited the valley, which is actually a hill, in June 2014. It was a very hot and sunny day so mrs Ech Wel was begging her travel-agent all the time when we would finally go to the beach. She isn´t really into ancient ruins and prefers a tan. 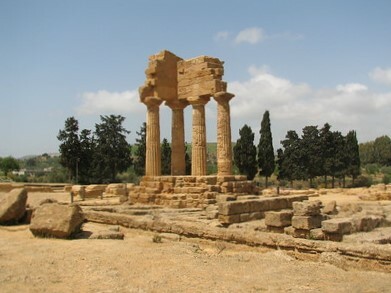 There are 7 temples on site of which the one named Concordia is the best preserved. It was named after a Latin text found near the temple which was talking about harmony among humans. (Concordia is the latin word for unity and concord.) It was kind of appropriate as this was our honeymoon. Even more suiting was our visit to the temple of Hera, the goddess of marriage and weather conditions! It is an old custom for young couples to visit the sacred building to quarantee a successfull wedding. We paid our homage of course and called it a day. Off we were to the nearby beach of Eraclea Minoa. Our appartment was at the foot of the Etna vulcano and as we came in her neighborhood we discovered that the clouds we had been seeing were actually smoke plumes! I checked the map we had been given in the Valle dei Templi and soon noted what was wrong. We hadn't paid attention to the temple of Hephaestus aka Vulcan, the God of fire! According to ancient mythology he had his workshop beneath Etna and he was now taking his revenge on us. So if you happen to be in the neighbourhood, make sure you pay respect to the ancient gods! Read more from echwel here. I visited this WHS in May 2015. I had been wanting to visit this site but I wanted the reconstruction work to be ready before visiting. My patience was rewarded and the yellowish remains of Magna Grecia stood as might as ever on a sunny afternoon when I visited. As I was visiting by car, I decided to park in the car park which was farthest from the Temple of Concordia. Then I took a convenient taxi ride costing 3 euros per person to the opposite side of the archaeological park and walked downhill visiting the 5 most important temples of Agrigento one after the other. The garigue setting around the temples (olive trees, Mediterranean shrubs, prickly pears and pine trees makes you forget the urban sprawl of the New Agrigento in the not so distant background and I enjoyed unforgettable moments of tranquillity during which I had the temples all to myself. In Summer tourist groups are known to flock by the thousands here but I was quite lucky during my visit. The museum is worth visiting too even though the ticket price is quite steep. My visit ended just next to the car park so the 3 euros taxi ride was well worth it. 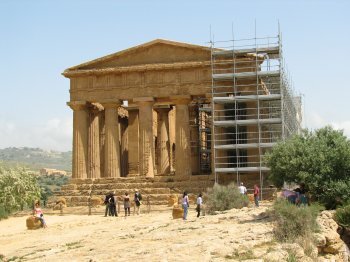 Although I visited several other Greek temples/remains in Sicily, the Valley of the Temples is by far the most complete and the most outstanding and having visited the Acropolis in Greece last year, I can safely say that the overall experience in Agrigento matches or is even better than the great experience of visiting the Acropolis in Athens. I'm eager to visit Paestum in the near future to be able to compare but it will be quite difficult to have a better experience than the one I had here. The highlight of my trip was definitely the Temple of Concordia (photo) which I viewed also at night time from the terrace of a nearby restaurant. Truly breathtaking ! Catching an early bus outside Agrigento station I reached the Valley of the Temples just as the gates opened. This enabled me to make a tour of the temples of Concord, Juno and Hercules before the crowds arrived. Equally interesting to me though were the 19th centuary bronze statues scattered amongst the ancient Greek ruins. No visit to Sicily is complete without a visit to Agrigento. The temple of Concordia is one of the most completely preserved Greek temples to be found anywhere. (Its preservation is due to its being turned into a church.) Just to see it alone is worth the trip. At night it is lit by floodlights and makes a marvelous sight. Besides this temple there is much more Greek history to be seen here. There are several ruined temples and a sacred spring site. Nearby the spring is a temple made into a Byzantine church with a rare well preserverd temple altar. 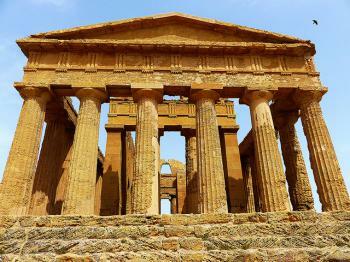 The ruins of probably the largest Greek temple ever attempted is in Agrigento. It had human figures as supporting columns which I think is unique in Greek temples. You can see one of these lying on the ground. Besides Greek remains there are some interesting grave excavations and an area of the Roman city exposed. I was lucky to visit in May when the whole area is ablaze with beautiful wildflowers. There are many places in Sicily where you feel like you've somehow ended up in Greece; Agrigento is one of those places. The valley complex has several well-preserved temples and the ruins of others that were among the biggest ever built, but I couldn't help but be somewhat disappointed. I was more impressed by the temples and acropolis of Selinunte (just up the coast to the west)which gave a much better insight into life in a 5th century BC Greek colony. Still, Agrigento is a very important archaeological site and well worth a visit for the day. I highly recommend the drive from Palermo; some of the landscape is just gorgeous. 190 Community Members have visited.